The wood cabin is still there. The store house too, though a century’s worth of long winters have taken their toll. The roof’s mostly gone, the windows long broken and even the walls are begin to fall in upon themselves. The wood boards are weathered to the color the landscape and the sky, lifeless gray. There were hundreds of these remote outposts scattered throughout the Canadian north. Small trading posts where the local population traded their traditional subsistence hunting for a new form of killing; wholesale slaughter in exchange for guns and money and trade goods. The skills of a thousands winters’ survival turned to the goal of profit. Here at least, there’s nothing left of all the ingenuity and ambition and industry; just broken glass, a rusted stove, two spools of galvanized barbed wire. 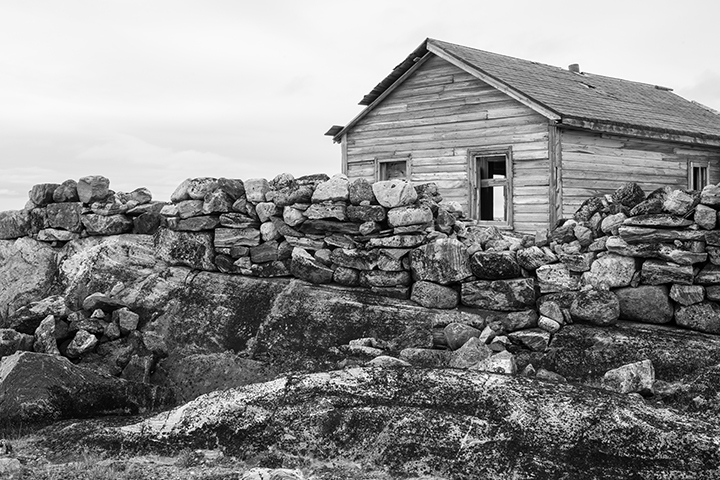 A stone wall still surrounds the cabin, lower in front of the windows to allow a view of the winter’s meager light, and perhaps better sight lines on approaching visitors. I try to imagine it, the mix of ambition and determination and desperation that would drive a man to come to this place, to bring your wife here, for a year or more. Traders for the HBC, and the hard men of the Northwest Mounted Police, trying to carve out an existence here at the very limits of the known world. A mournful air hangs over this silent land. I’ve been told the story of a police constable who went out on patrol, leaving his wife behind to feed the sled dogs. She somehow slipped and the dogs were upon her. There was no one close enough to help. Stone mounds dot this coastline, graves of those who didn’t survive their northern trials. But near the cabin, there’s a grave that shows more care than the others, a foundation ring of large stones filled with fine gravel, forming a flat bed away from the cold ground for a casket, then a tall mound of stones covering it over. I stand there for a long time, thinking of the story and looking at that grave. Could you build a grave big enough to honor that kind of loss? Are there enough rocks in this entire godforsaken stone-covered landscape to bury that much grief? And when he passed those windows, as each of that endless winter’s days turned to darkness, how could he look at anything else, and not claw out his own eyes to keep from seeing it? Or after shooting every miserable cur in the dog lot, finally turn the gun on himself? There are some things that no one should have to bear, not so far from home, not in such a lonesome land. The legend has it that some nights you can hear the ghosts still, but I heard no music, no woman’s cries. There was nothing but the mournful wind, already carrying the first hints of fall. I look around the bay, trying to feel something other than a terrible sadness. There’s nothing for me here. Overhead, flocks of Snow Geese are carried on the wind, beginning their long migration south. I can only lift the anchor and turn my boat to follow. This entry was posted on Thursday, September 3rd, 2015 at 12:24 pm. It is filed under On the Road. You can follow any responses to this entry through the RSS 2.0 feed.